After bonding over a mutual feeling of being bored on the weekends, we decided over dinner one night to make a program that highlighted the hidden events on Clemson University's campus. It always seems like there's nothing to here, but Sujestr proves that isn't true. 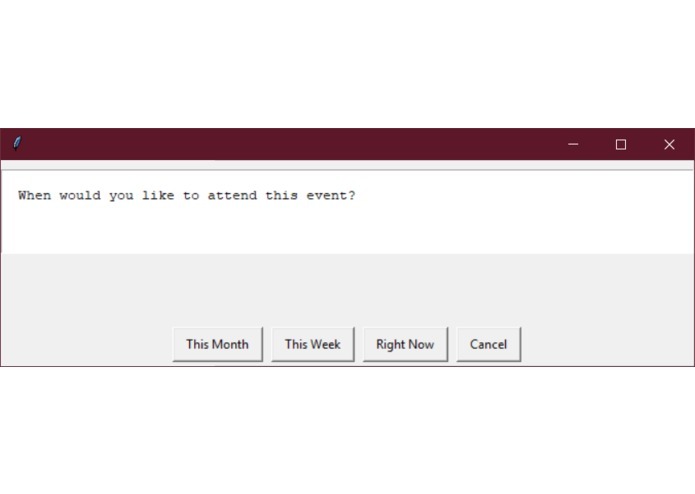 Asks the user some input to determine what they may be interested in, then display a random activity which they may want to pursue. If the user does not like the activity presented, the user can run the program again to display another activity which they may be interested in. Web combing for dated activities and a set list for undated activities. A random number generator allows the program to give a random output. Initially we did not know python, the main language of this program. We realized we could not use Amazon Alexa skill because we did not sign up with enough time so we resorted to a GUI. We were not sure how to run a random number generator in Python so we had to figure that out. The web combing capabilities seemed to be a daunting task, but due to the perseverance of certain group members, we were able to successfully include dated activities in the program. Another great achievement was the ability to write this program in a language we did not know before we arrived. We learned how to divide a major task into individual parts and combine all elements together to form the main project. To do this we had to learn how to program in new languages, work as a team/leader, use the internet to trouble shoot, and many other skills. The next stages of this program would be to expand out of Clemson and into whatever location the user may be in. Boredom is a problem among students outside of Clemson as well, so the same code combing a different locations calendar website would benefit other people just as much. I built the portion that scrapes the website for the relevant information, and I put the other parts into the final product. I created the code template for our GUI interface, and sourced the needed libraries. I also compiled our separate parts into the final repository for GitHub and created the readme.